Samsung isn't waiting until April 10 to tell you more about its next Galaxy A phone - the Galaxy A70. While the exact pricing and availability specifics of the Galaxy A70 are still under the wraps, Samsung has unwrapped everything else - this includes both design and hardware. In line with Samsung's new-age product strategy with regards to its new Galaxy A devices, the Galaxy A70 also brings many firsts to the lineup including an unusually tall 20:9 Infinity U screen and 25W super-fast charging. The design scheme is familiar if you've crossed paths with recent Galaxy A phones primarily the Galaxy A50 - the Galaxy A70 seems to be a gradual step up in the series. Which means that Samsung is using its 3D ‘glasstic’ design in the Galaxy A70 - which essentially means that the phone is made of plastic with glossy finish. The Galaxy A70 will be available in Black, Blue, Coral and White colour options. Like the Galaxy A50, the Galaxy A70 also ditches a conventional fingerprint scanner in favor of an in-display reader. The Galaxy A70 comes with a 6.7-inch 1080p+ Super AMOLED display - its 20:9 aspect ratio is a first for any Samsung phone. The phone is powered by a 2GHz octa-core processor (unspecified) with 6GB and 8GB RAM options with 128GB storage which is also expandable. The dual SIM phone runs Android 9 Pie-based One UI - same software that's inside Samsung's flagship Galaxy S10 phones. The Galaxy A70 further packs a sizeable 4,500mAh battery with 25W fast charging through USB Type-C.
On to the cameras, the Galaxy A70 comes with three rear cameras consisting of one 32MP sensor with f/1.7 aperture, an 8MP ultra-wide sensor and a 5MP sensor for depth sensing aka portrait photography. On the front, the Galaxy A70 comes with a 32MP camera with f/2.0 aperture. 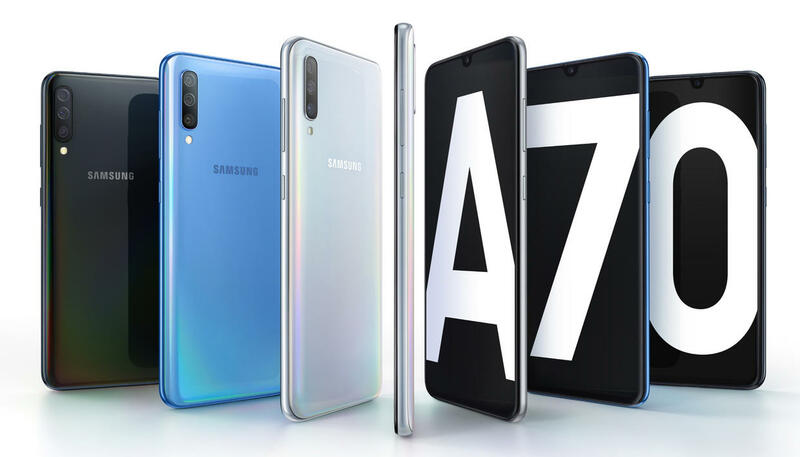 Samsung will announce Galaxy A70 pricing and availability details "at ‘A Galaxy Event’ – taking place across three different continents on April 10," which is also possibly when we'll get to know if the Galaxy A70 will come to India anytime soon.